Memorial Day marks the traditional kick-off the American summer vacation travel season, and according to AAA estimates, this years three-day weekend could be great. With cheaper gas and an improving economy, the AAA says this could be the second busiest Memorial Day on record. This is great news for Innkeepers in Elk Grove because our city is about to be over-run with passport-toting tourist. This great news comes to us according to Elk Grove Vice Mayor Steve Ly. 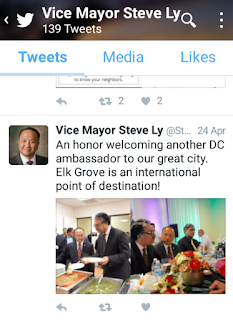 That was the proclamation issued by Elk Grove's only nationally, check, make that internationally known elected official, via his Twitter account about a month ago. This slipped by us because EGN has been blocked from the internationally known Vice Mayor's Twitter account, but thanks to a reader, we can help spread the Gospel according to Ly. So if you see heavier the normal traffic in town this weekend, or just in general, especially cars with Canadian or Mexican plates or an over abundance of rental cars, we all know the reason. 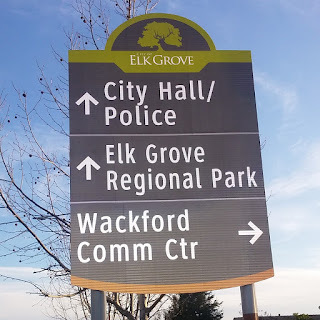 Likewise, if you encounter a person speaking a foreign language or American English with a distinct twang, say from West Texas, walking along the street with a bewildered look as they study their "Grove" tourist maps, extend a warm Elk Grove greeting and help them find their way around town. Yes, thanks to Vice Mayor Ly's proclamation, we are now an international destination so get ready for a regular throng of international tourist descending on our city. It may cause traffic, but hey it will bring us lots of sales tax revenues, and an international flair rivaling that of Yuba City. And who knows, maybe the Howard Hughes Company will be sufficiently motivated by all those discretionary tourist dollars spent by free-wielding travelers to get off their rear end and finish building the Ghost Mall. We can see it now - busload of foreign well-heeled tourist converging on the Outlet Collection at Elk Grove. Alas, by transforming Elk Grove into an international jet set spot has resulted in some short-term collateral damage. That damage is all of the recently installed Elk Grove wayfinding signs. Now that we are an "International Point of Destination" as proclaimed by the Vice Mayor, we taxpayers may have to cough up another $400,000 or so to convert the signs to accommodate a multilingual audience. That my friend, is a small price of success!